Cairo is the capital and largest city of Egypt. 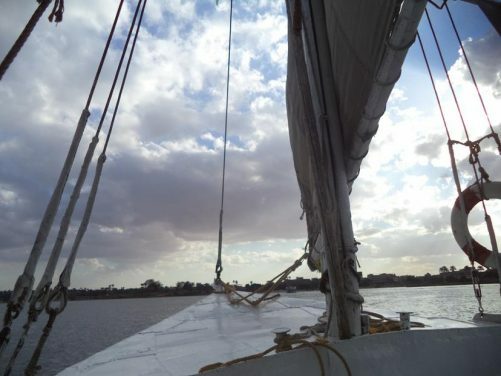 It is huge with a population of over 19.5 million people spread across many districts on both the east and west banks of the river Nile. 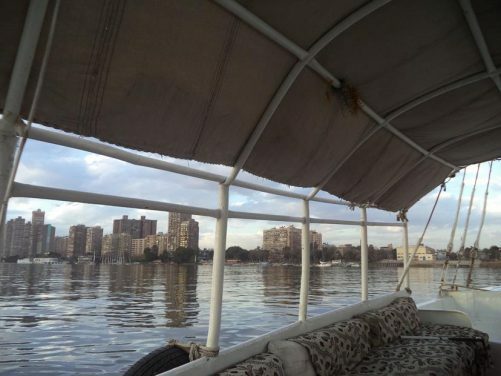 The modern city was founded by the Arab Fatimid dynasty in 969 AD, but it covers the remains of ancient national capitals whose remnants are still visible in parts of Old Cairo. 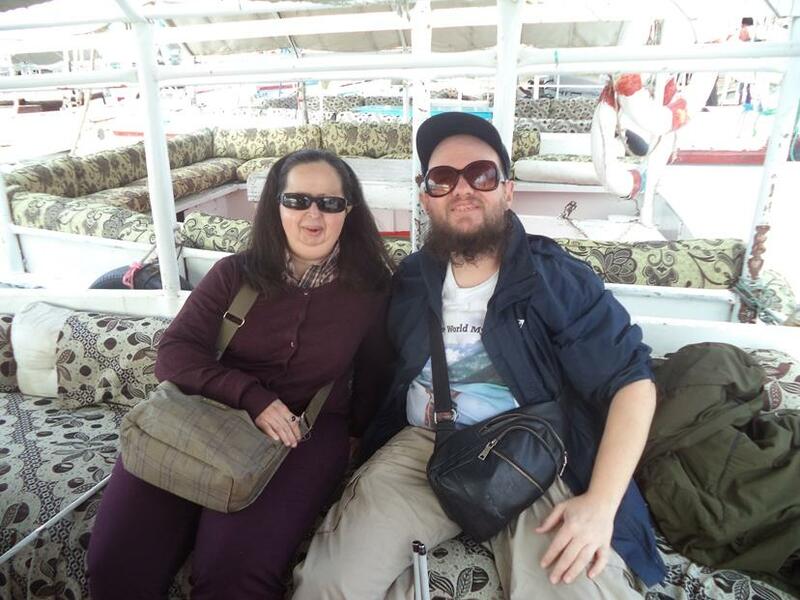 Tatiana and Tony onboard a felucca, a traditional wooden Egyptian sailboat, on the river Nile. 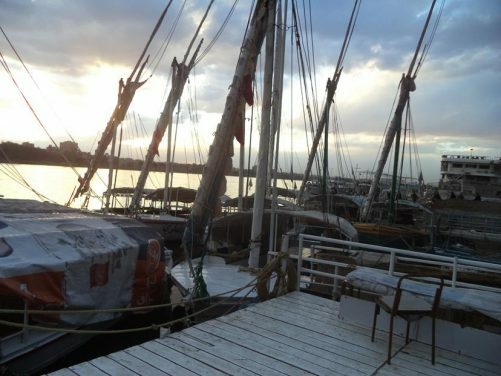 The boat is moored with other feluccas visible along side. Afternoon of 18th February 2019. 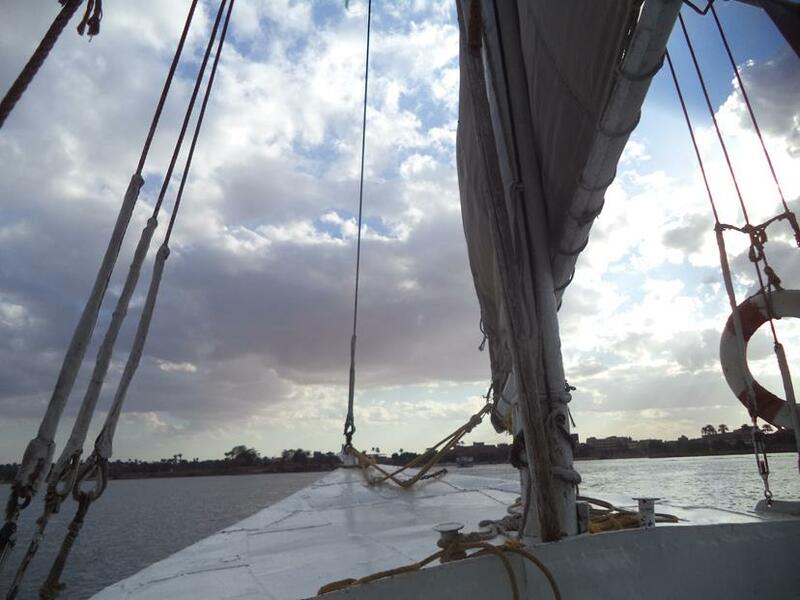 View across the Nile from the bow as the boat sets off. The base of the mast immediately in front. The boatman holding the rudder at the stern of the boat. Passing a cluster of tall buildings as the boat passes along the river between Cairo and Giza. Tony holding the end of the rudder with the boatman behind. View of inside the felucca with seating down the sides and a canvas roof above. Beyond trees and building along the river’s far bank. Looking further along the river. This part is more built-up with several tall apartment or office buildings. Small boats moored along the bank. Again looking along the river from the bow. The base of the sail in view. 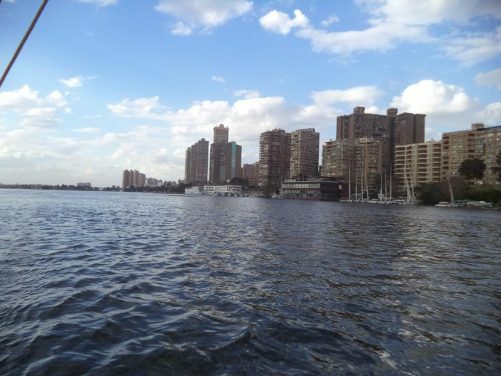 Buildings of Cairo or Giza along the bank. 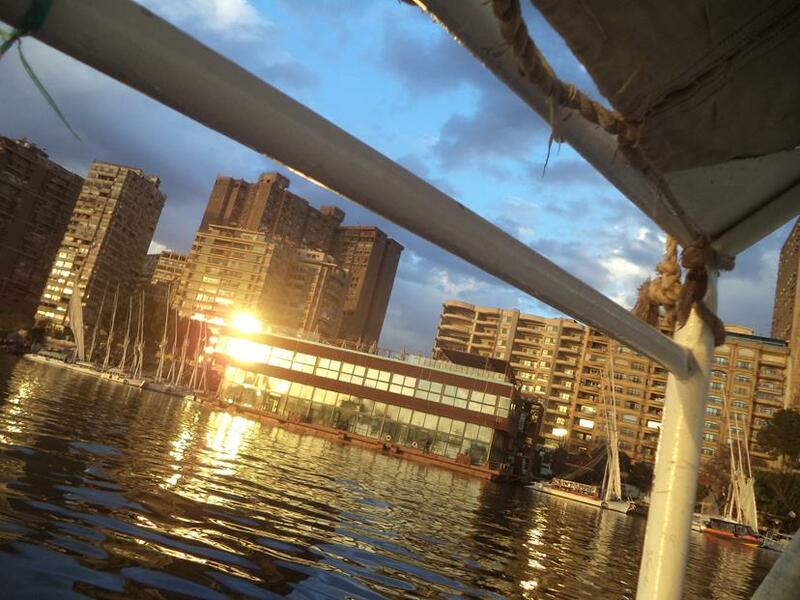 The setting sun reflecting on the windows of buildings as the boat passes along the river. 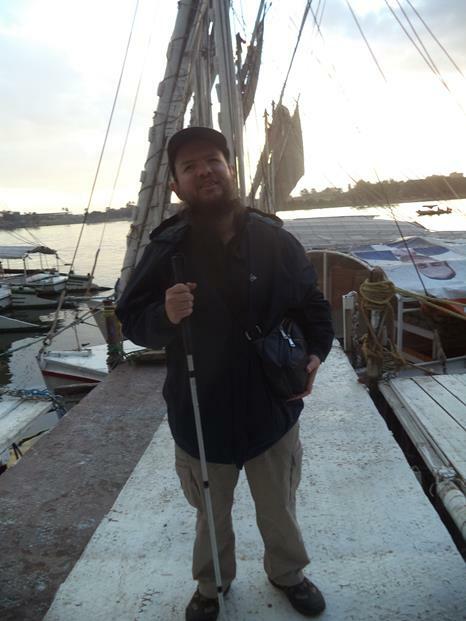 Tony on a jetty with the felucca and other boats moored behind. The masts of sailing boats in the foreground and the setting sun reflecting on the surface of the Nile beyond. 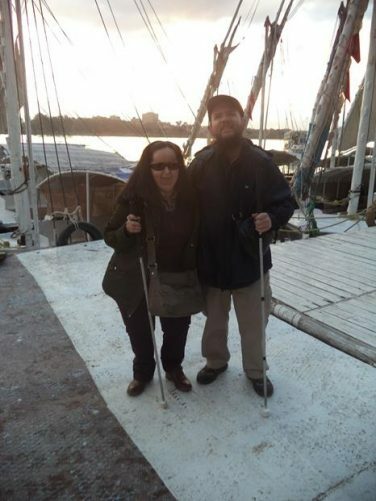 Tony and Tatiana with the Nile behind. 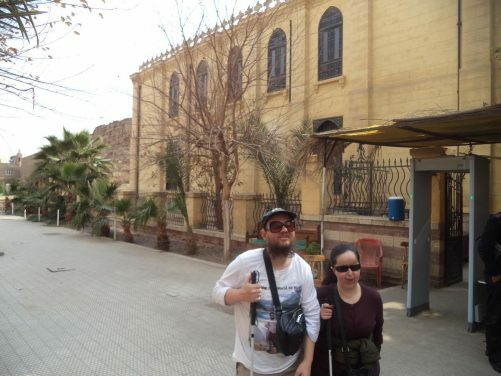 Exterior of the Museum of Egyptian Antiquities, also commonly known the Egyptian Museum or Museum of Cairo. 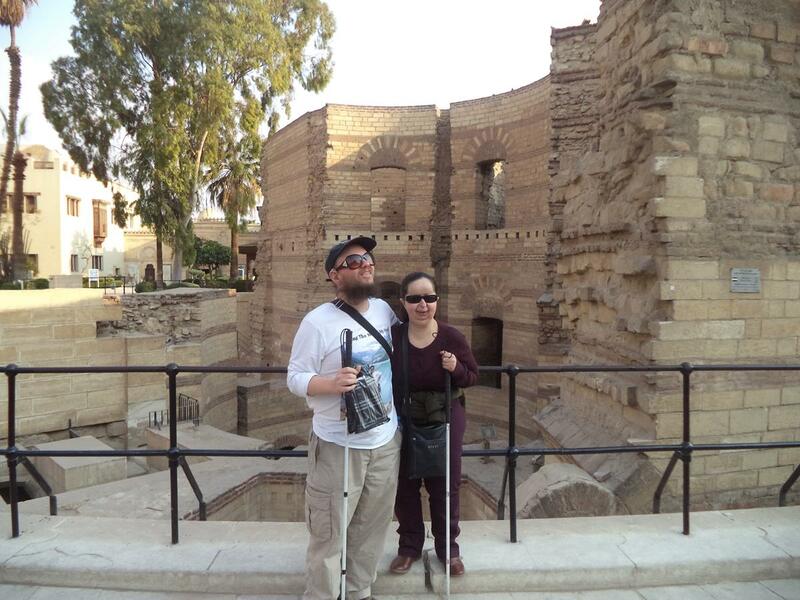 It is home to an extensive collection of ancient Egyptian antiquities with around 120,000 items in its collection. 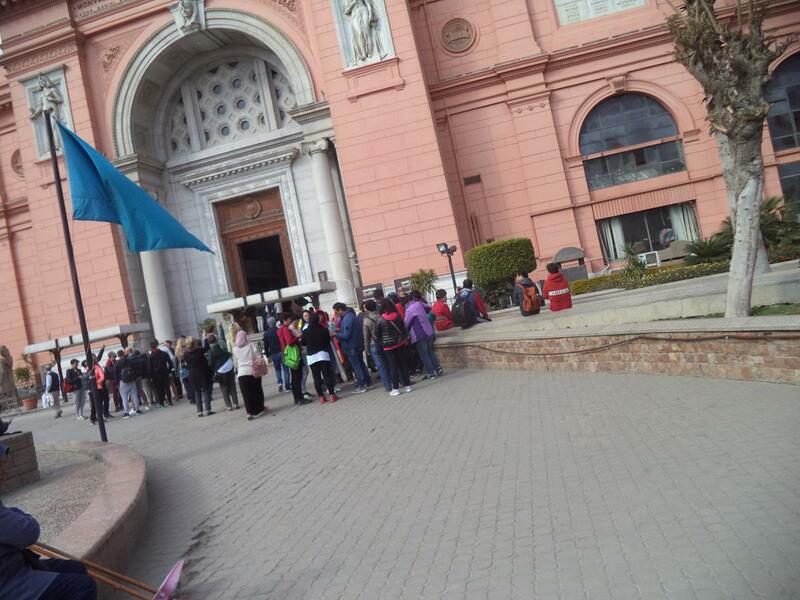 People queuing outside the Museum of Egyptian Antiquities. 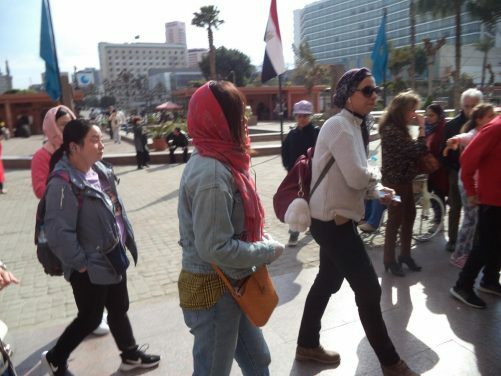 Looking across a plaza, which is part of Tahrir Square. The Nile Hotel in view to the right. 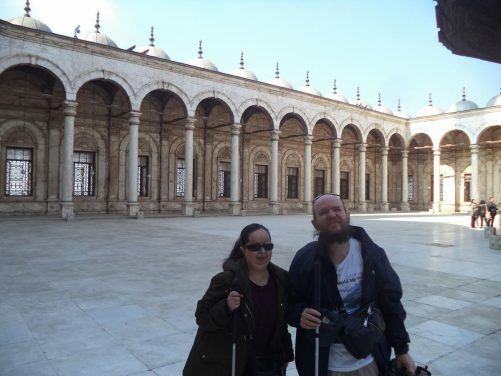 Tony and Tatiana in the courtyard of Muhammad Ali Mosque. Behind is a large shadirvan, a fountain often found near the entrance of mosques, used for ritual washing by Muslims before prayer. The fountain is shaded by an octagonal roof. The mosque is located on the summit of Cairo Citadel. The citadel is a large imposing fortress located atop Mokattam hill near to central Cairo. It was originally built by Saladin in 1176-1183 to protect the city from attacks by European Crusaders. 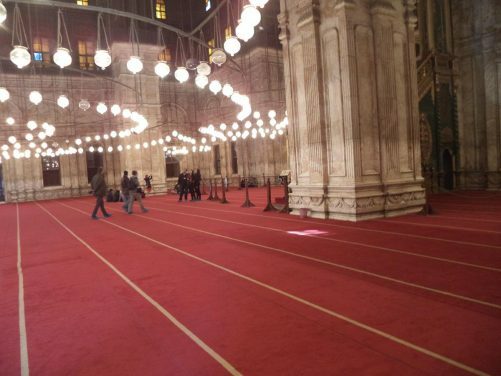 Another view of the square-shaped courtyard of Muhammad Ali Mosque. The edges are covered by a peristyle colonnade. 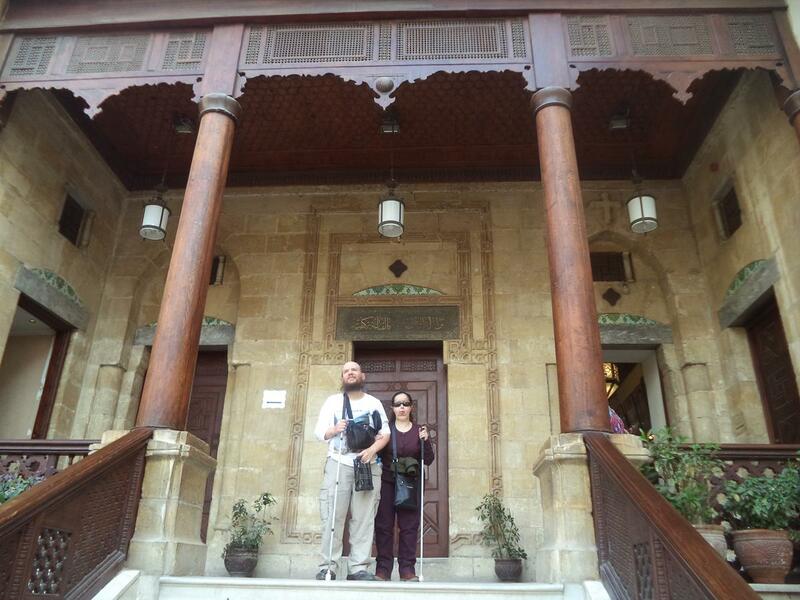 The mosque was constructed by Muhammad Ali Pasha between 1805 and 1848. It was built in memory of Tusun Pasha, Muhammad Ali’s second son who died in 1816. 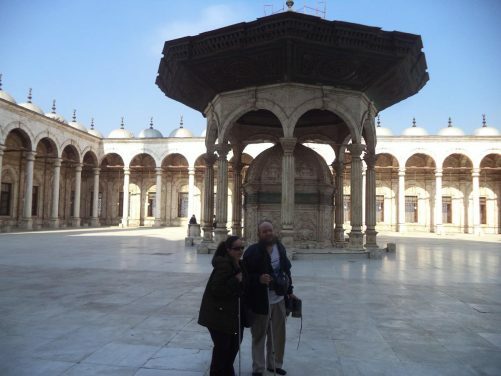 However, it also represents Muhammad Ali’s efforts to erase symbols of the Mamluk dynasty that he replaced. 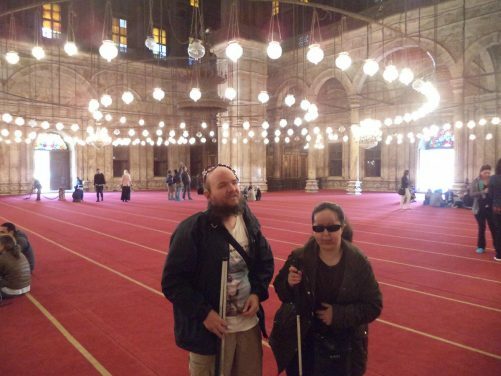 Tony and Tatiana inside the mosque. The interior walls are tiled with alabaster. There is a dome in the centre. Again the red carpeted interior of Muhammad Ali Mosque. 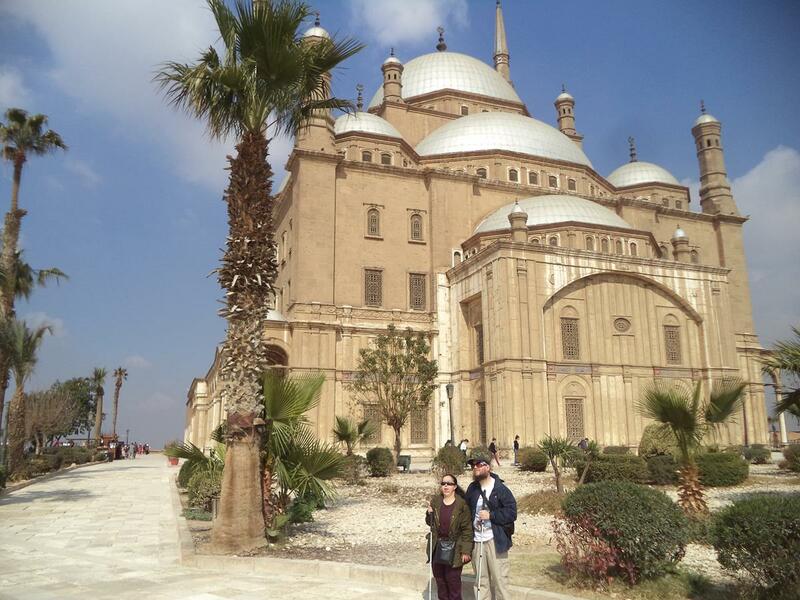 Tatiana and Tony in Cairo Citadel with the exterior of Muhammad Ali Mosque immediately behind. The mosque’s thick limestone walls are topped with a central dome which is 21 metres in diameter and 41 metres in height from the ground. The dome is surrounded by smaller domes and half domes. Two elegant cylindrical minarets of Turkish type with two balconies are situated on the western side of the mosque and rise to 82 meters. 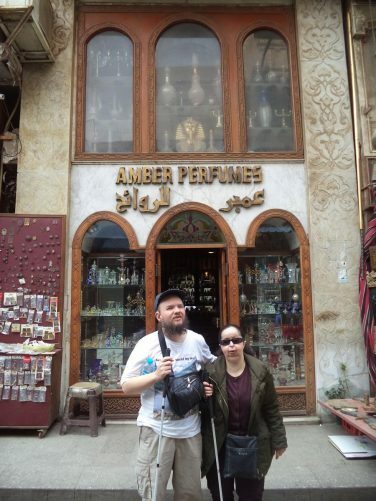 Tony, Tatiana outside a perfume shop after purchasing a bottle of perfume! They are in Khan al-Khalili bazaar, Cairo’s largest market. 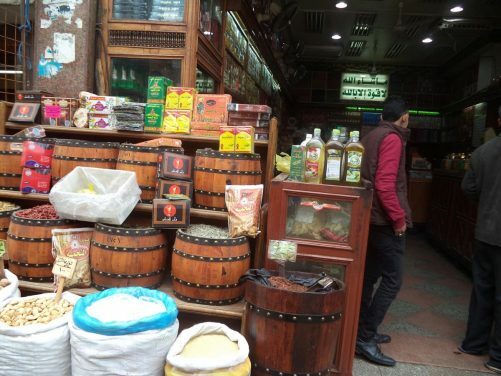 View along a busy street in Khan al-Khalili bazaar. 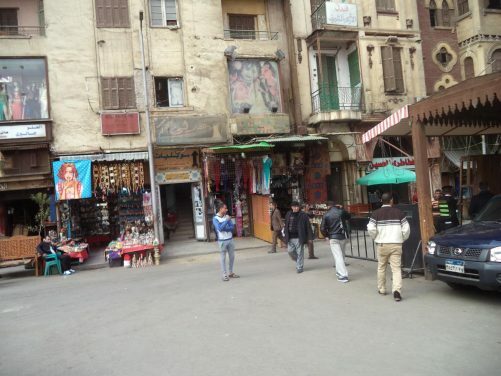 It is lined on both sides with shops selling a wide variety of goods. 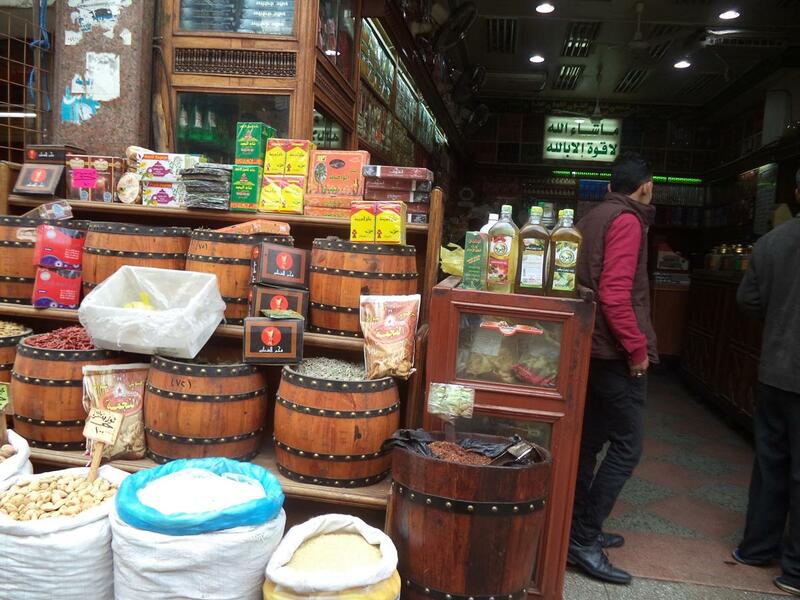 Outside a shop with sacks and barrels containing foodstuffs in Khan al-Khalili bazaar. A rather dilapidated looking row of shops at Khan al-Khalili bazaar, mostly selling clothes and craft items. The minarets and domes of Al-Azhar Mosque seen from a nearby street. The mosque was founded by Caliph Al-Mu’izz li-Din Allah of the Fatimid dynasty in 970, making it one of the oldest in the city. 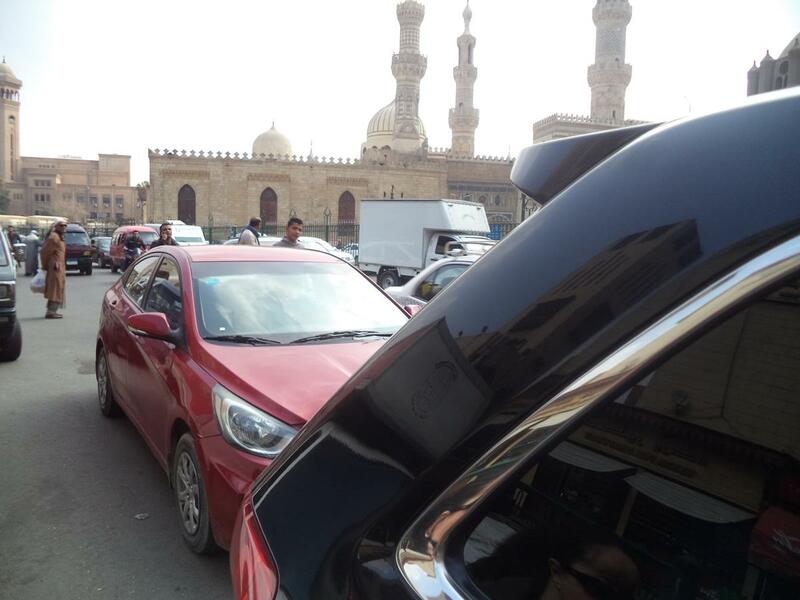 The complex also houses Al-Azhar University. One of Al-Azhar Mosque’s historic minarets and the dome of the comparatively more recent Mosque of Abu Dahab which stands along side. The Mosque of Abu Dahab was established in 1774. Tony and Tatiana outside Ben Ezra Synagogue, located deep in the winding alleys of Coptic Cairo. Ben Ezra Synagogue is the oldest Jewish temple in Cairo, dating from the 9th century AD. In the 19th century, a huge cache of documents was discovered in the synagogue’s treasury, which recorded the history and transactions of Cairo’s Jewish community since the 11th century, providing the most complete account of medieval Jewry anywhere in the world. These documents are now held at Cambridge University. 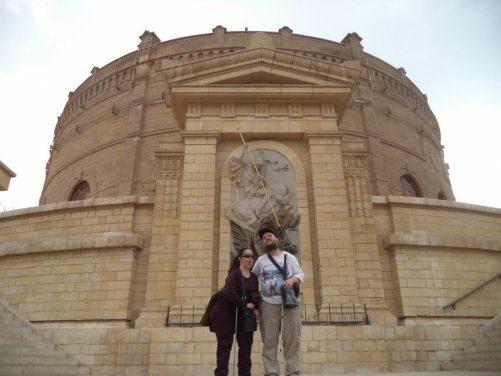 Two separate myths state that the synagogue was built on the site where the pharaoh’s daughter found Moses hidden in the reeds of the Nile or on the site of the Temple of Jeremiah. Tony and Tatiana outside Saints Sergius and Bacchus Church in Coptic Cairo. This is one of the oldest Coptic churches in Egypt dating back to the 4th century. 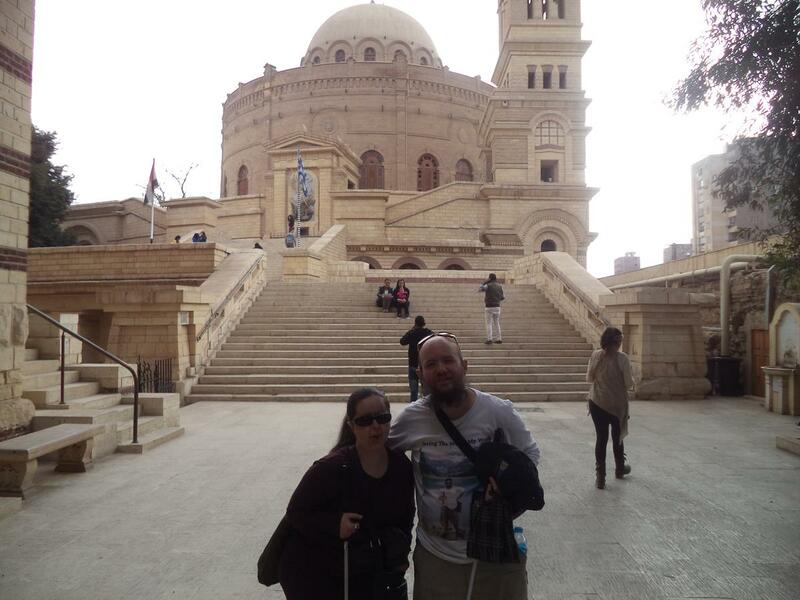 It is said to have been built on the spot where the Holy Family, Joseph, Mary and the infant Jesus Christ rested at the end of their journey into Egypt. Tony and Tatiana were unable to enter the church due to a mass. 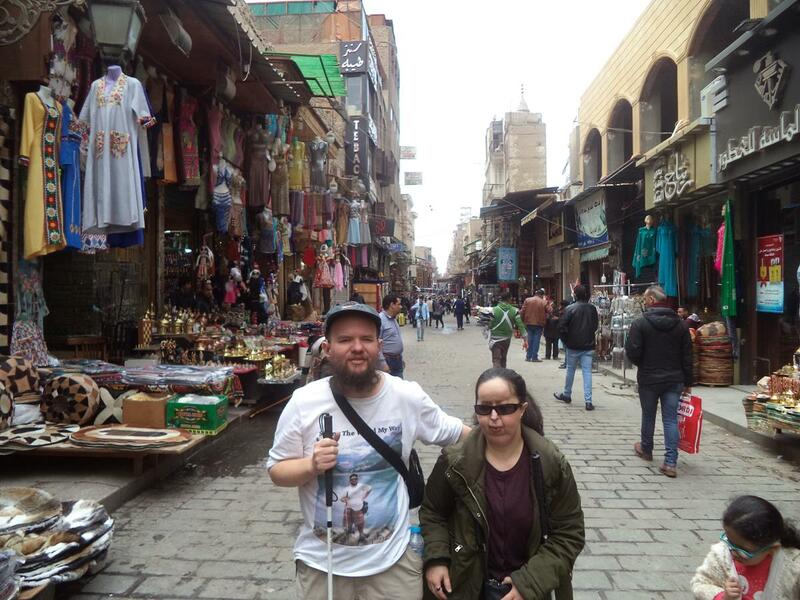 Coptic Cairo is part of ‘Old Cairo’ which encompasses the Babylon Fortress, the Coptic Museum, the Hanging Church, the Greek Church of St George and other Coptic churches and historical sites. 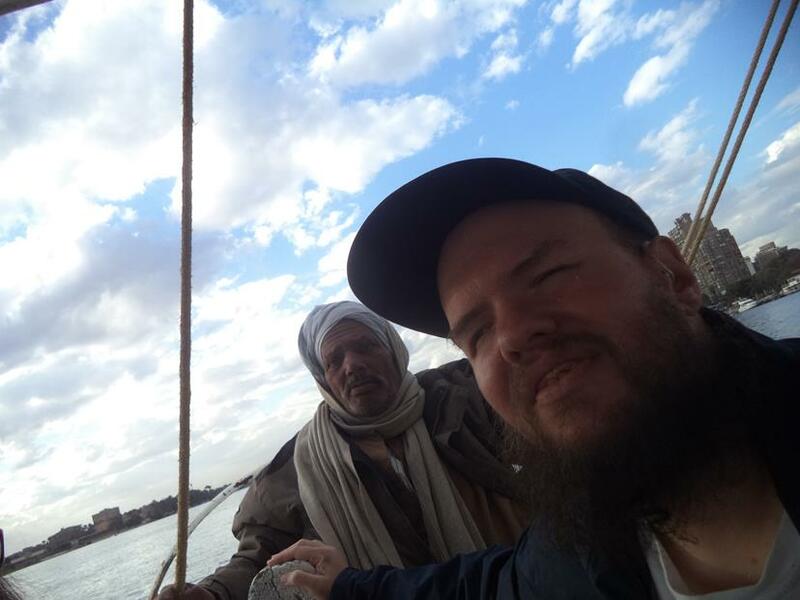 Coptic Cairo was a stronghold for Christianity in Egypt until the Islamic era, although most of the current churches were built after the Muslim conquest of Egypt in the 7th century. Tony and Tatiana in an entrance porch, probably to a church. A doorway in front. Busts of two Greek Orthodox Patriarchs of Alexandria at either side. 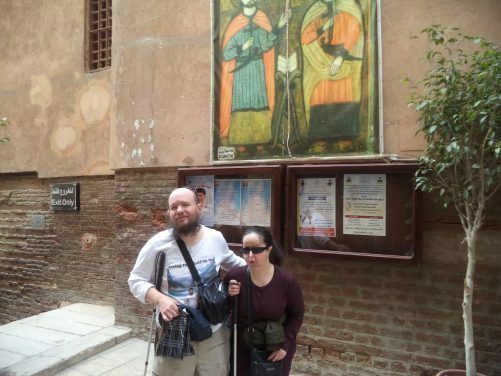 Tony and Tatiana at the foot of steps leading up to the Greek Orthodox Church and Monastery of St George located within the Babylon Fortress. The church dates back to the 10th century (or earlier). The current structure was rebuilt following a fire in 1904 with construction completed in 1909. The church has a central dome with a tower in the north-west corner. 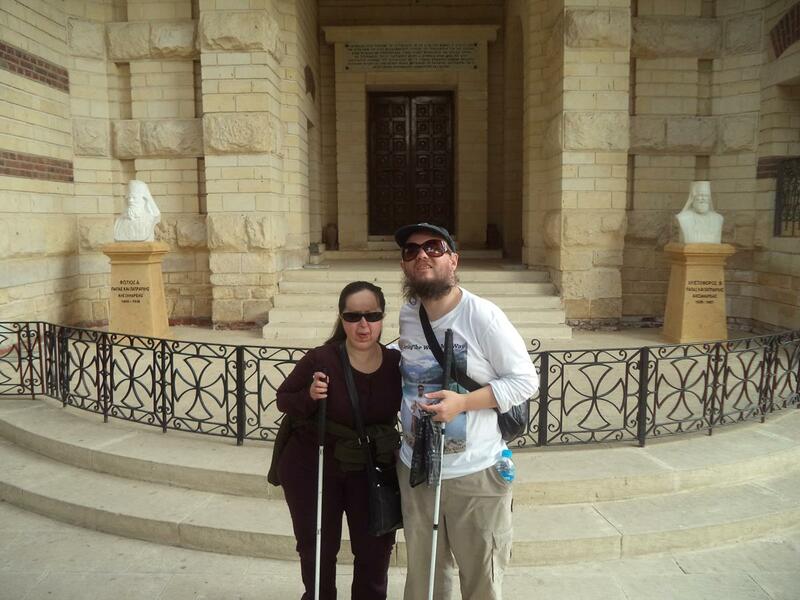 Tatiana and Tony part way up the steps outside the Church of St George. Tony, Tatiana inside the Church of St George. Candles can be seen. 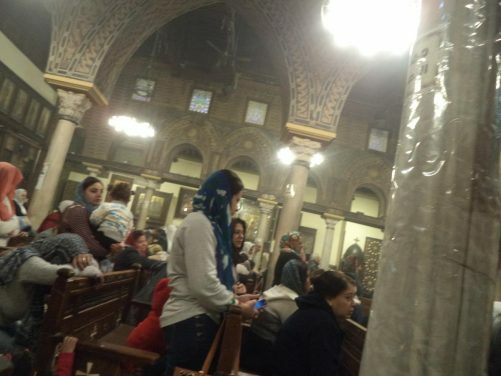 Worshippers sitting on pews inside the Hanging Church. 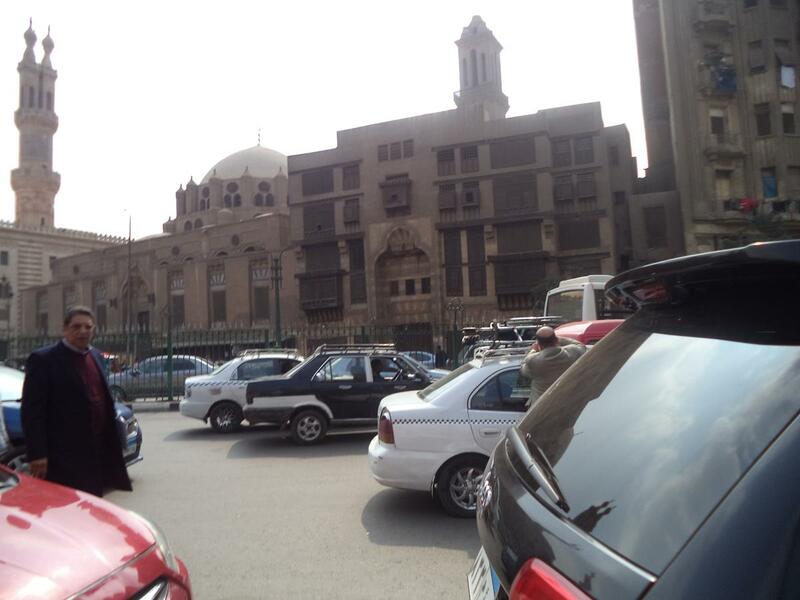 The church’s official name is St Virgin Mary’s Coptic Orthodox Church. 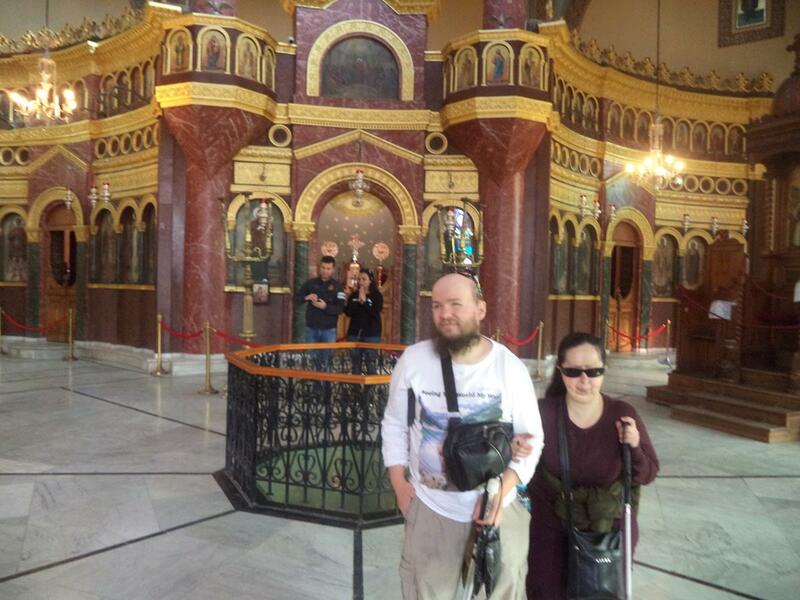 It belongs to the Coptic Orthodox Church of Alexandria. Its name relates to its location above a gatehouse of Babylon Fortress with its nave suspended over a passage. It was probably built during the patriarchate of Isaac (690–692) although it is thought there has been a church here since the 3rd or 4th century. Tony, Tatiana on a balcony outside the Hanging Church. Tony and Tatiana on Mar Girgis Street close to the Hanging Church. Behind are the ruins of a Roman prison. Another view of the Roman prison ruins. 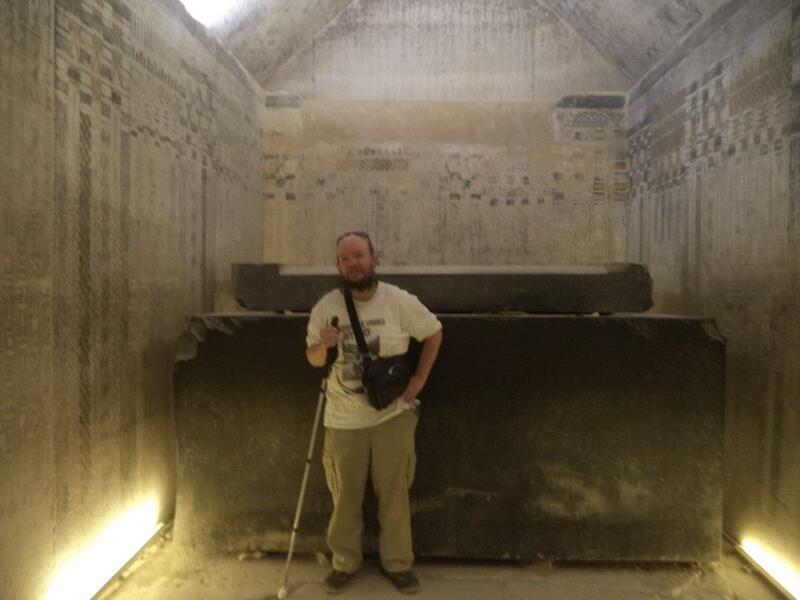 Tony inside the burial chamber of Unas Pyramid. The burial chamber’s basalt sarcophagus is in view as well as carved and painted inscriptions and decoration on the walls and ceiling. 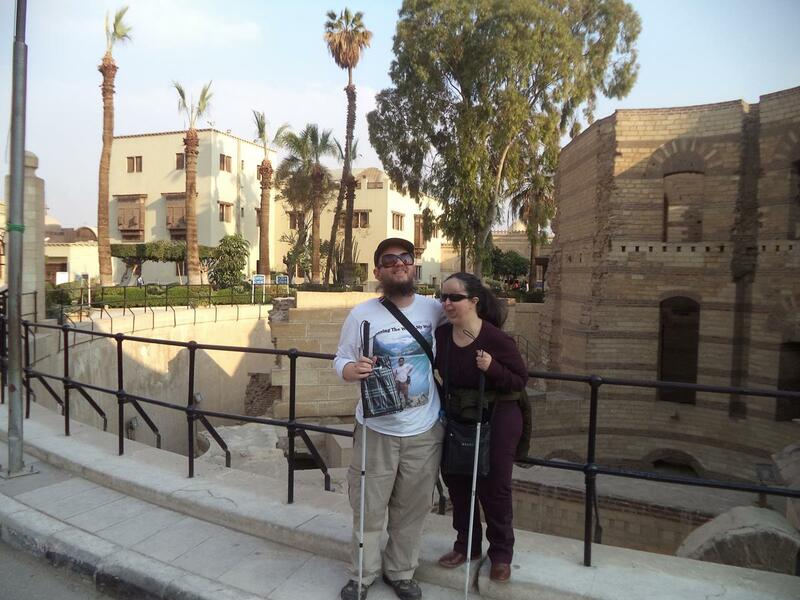 Tony and Tatiana outside Unas Pyramid. 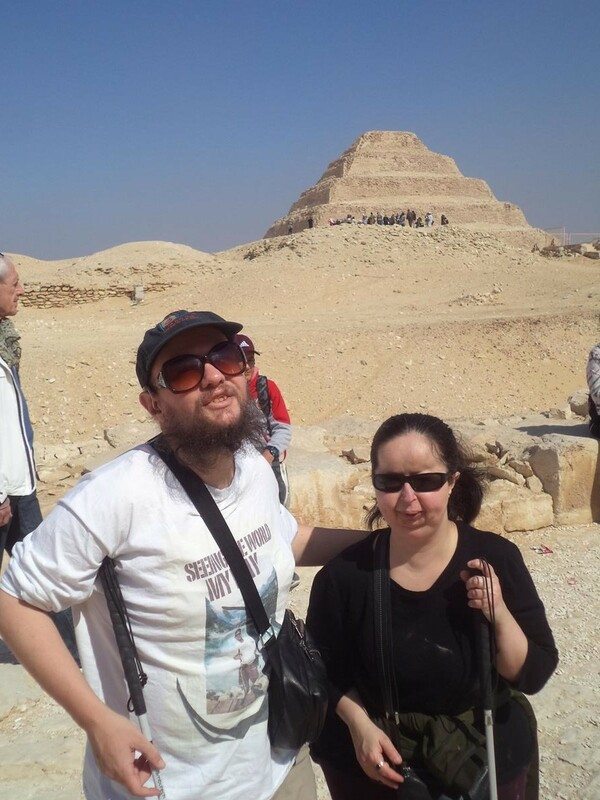 This pyramid was built during the 5th Dynasty (circa 2498 – 2345 BC) for the Egyptian pharaoh Unas, the ninth and final king of that dynasty. The pyramid’s outside surface was originally smooth, but is now ruined. It is 43 metres in height and 57.7 metres along the four sides of its base. Another view outside Unas Pyramid. 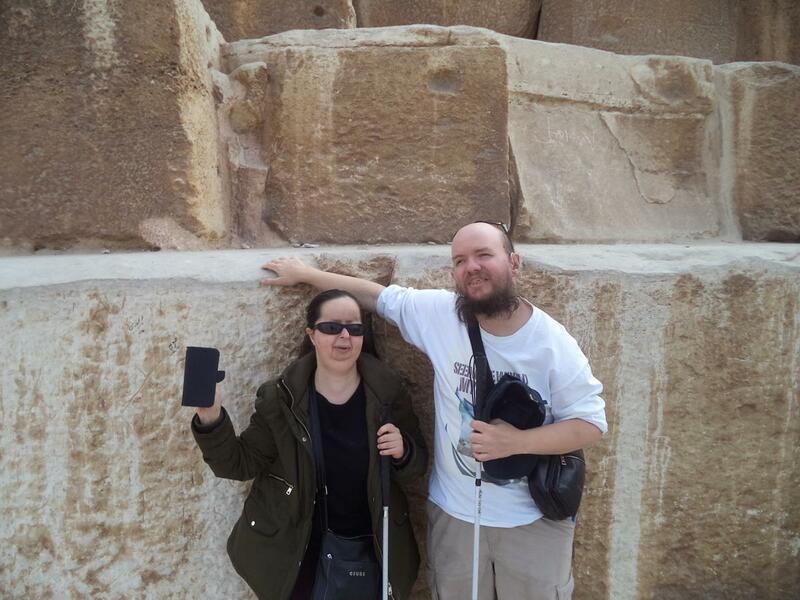 Tony and Tatiana with a view towards Djoser Pyramid (also known as Step Pyramid). The pyramid has six stepped levels and was originally clad in polished white limestone. 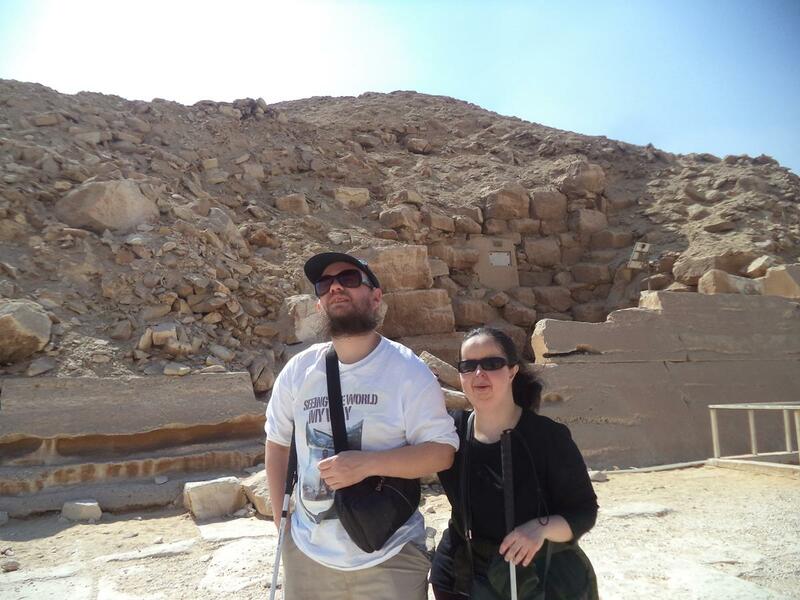 It was built during the 3rd dynasty of the Old Kingdom (circa 2686 – 2613 BC) for the burial of Pharaoh Djoser. It was originally 62.5 metres in height and 121 metres by 109 metres along its base. 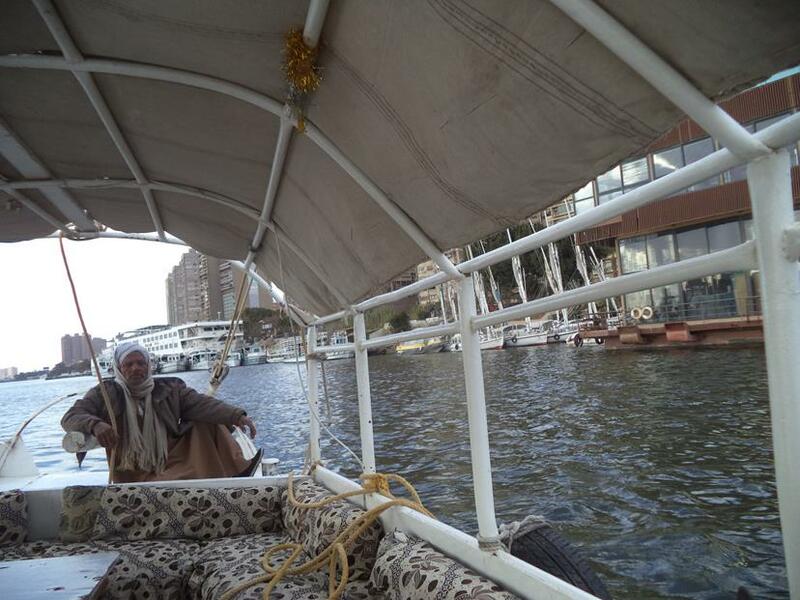 Memphis was the ancient capital of Aneb-Hetch, the first nome (territorial division) of Lower Egypt. 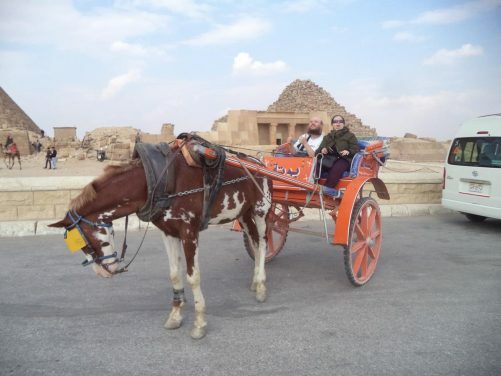 It was founded earlier than the 31st century BC and abandoned in the 7th century AD. 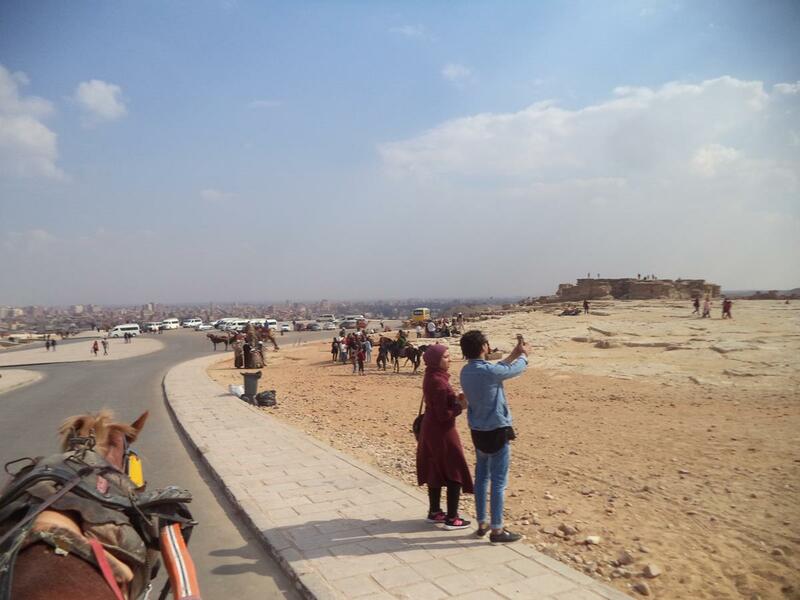 It was an important city throughout ancient Egyptian history and during its golden age thrived as a regional centre for commerce, trade, and religion. Its now ruined great temple, Hut-ka-Ptah (meaning “Enclosure of the ka of Ptah”), was one of the most prominent structures in the city. Today its ruins are located near the town of Mit Rahina, 20 km (12 miles) south of Giza. It has been a UNESCO World Heritage site since 1979. 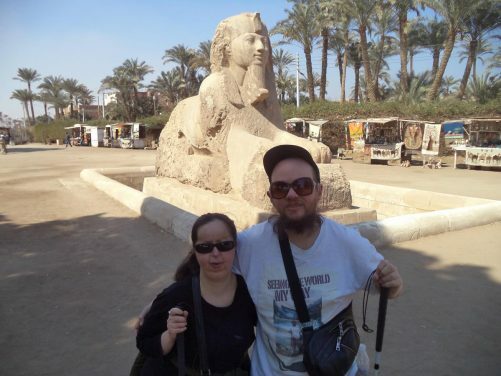 Tony and Tatiana with the Sphinx of Memphis. It is believed the sphinx was carved during the 18th dynasty, between 1700 and 1400 BC, which was during the 18th dynasty. The facial features imply that the Sphinx is honouring either Hatshepsut, Amenhotep II or Amenhotep III. It was discovered in 1912. It is 8 metres in length and 4 metres in height. 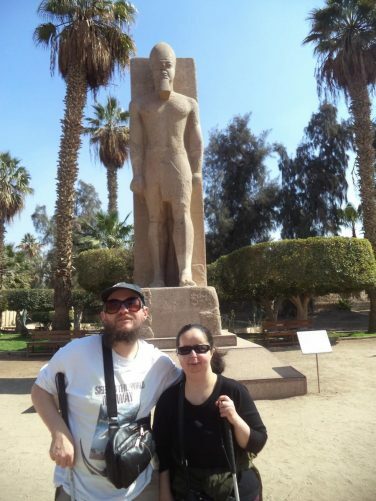 Tony, Tatiana with a statue of Rameses II. 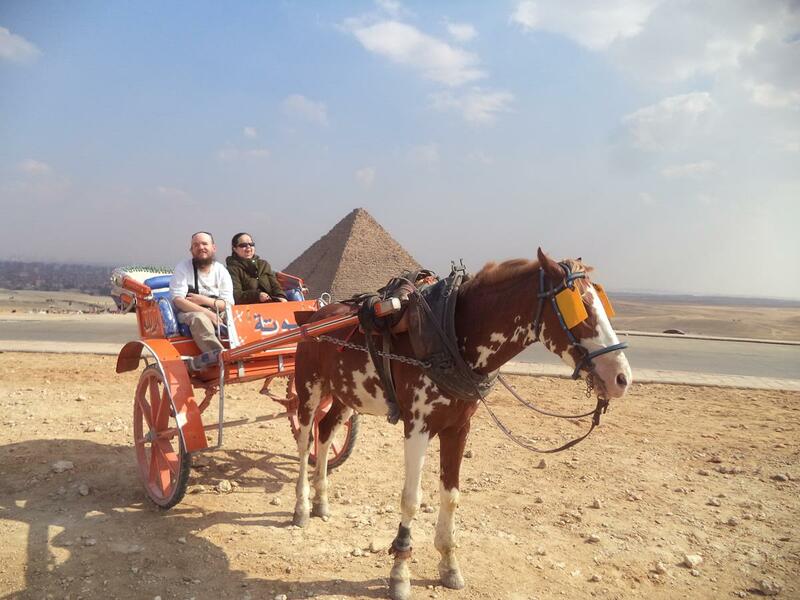 Giza has some of the most impressive ancient monuments in the world, including the Great Sphinx, the Great Pyramid of Giza, and a number of other large pyramids and temples. The monuments date from the Early Dynastic Period to the Late Period. 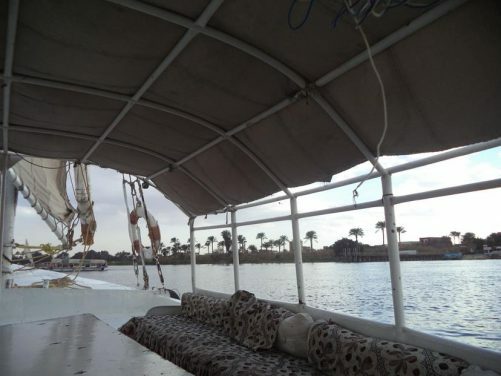 The site is located in the Western Desert, approximately 9 km (5 miles) west of the river Nile and approximately 13 km (8 miles) south-west of central Cairo. It is part of a UNESCO Heritage Site. 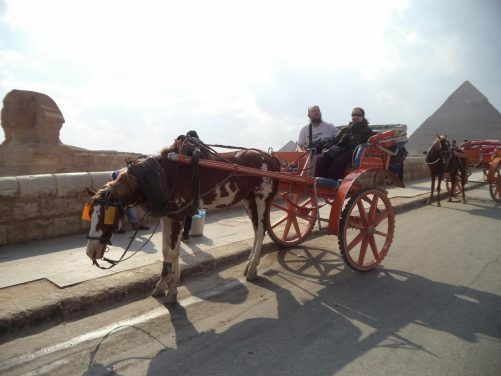 Onboard a horse-drawn carriage passing alongside the Great Pyramid of Giza (also known as the Pyramid of Khufu). Constructed circa 2580–2560 BC during the 4th dynasty. It is the oldest of the Seven Wonders of the Ancient World and the only one still in existence. It was originally 146.7 metres in height (now 139 metres) and is 230 metres along its base. For more than 3,800 years it was the tallest man-made structure in the world. Tatiana and Tony in the horse-drawn carriage. 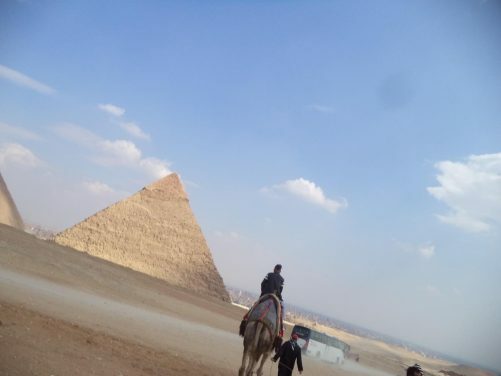 Behind two pyramids can be seen. The nearer one is the Pyramid of Khafre with the Great Pyramid of Giza beyond. 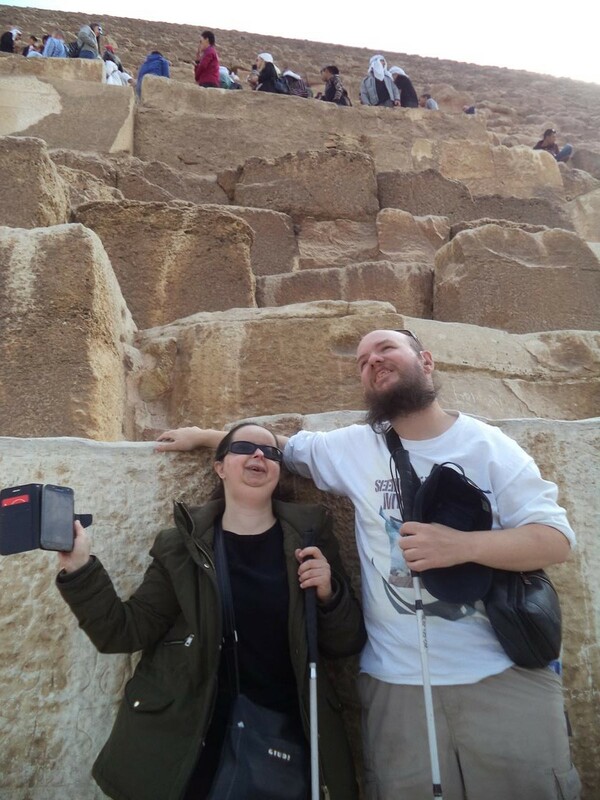 The Pyramid of Khafre is the second largest of the Giza pyramids, standing originally at 143.5 metres and now 136 metres. It is 215 metres along its base. 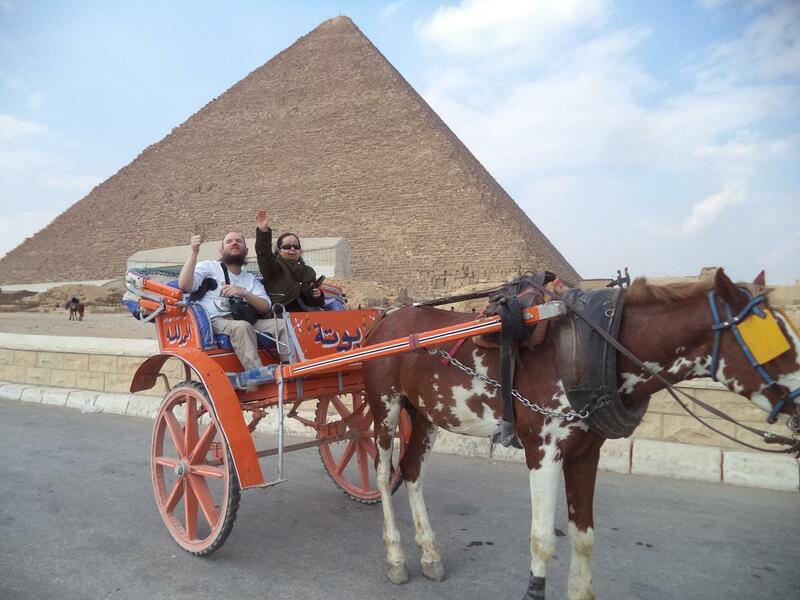 It is the tomb of the Fourth Dynasty pharaoh Khafre (Chefren), who ruled from about 2558 to 2532 BC. It appears taller than Great Pyramid of Giza beyond due to its more elevated position. 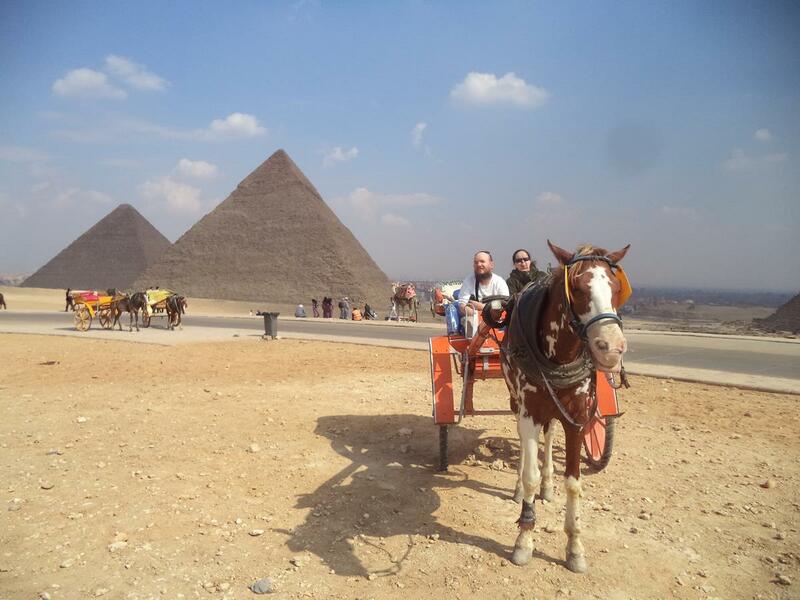 Tony and Tatiana in the carriage with the Pyramid of Menkaure in view. This is the smallest of Giza’s three main pyramids at 65 metres in height. Constructed circa 2510 BC during the fourth dynasty, it is thought to have been built to serve as the tomb of Pharaoh Menkaure. 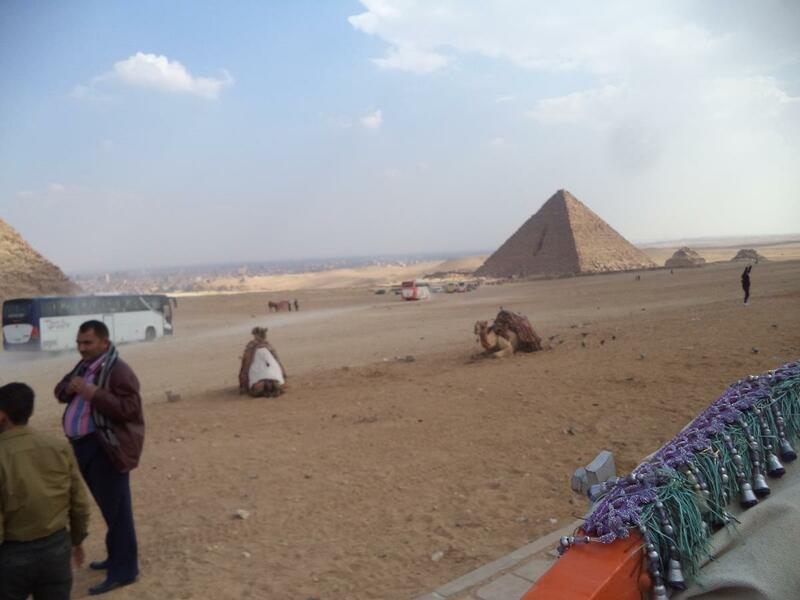 Another view of the Pyramid of Menkaure and the surrounding desert landscape. Camels sitting in the foreground. 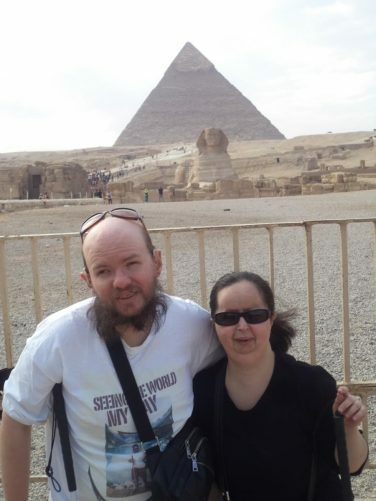 The Pyramid of Khafre. Casing stones still cover roughly the top third of the pyramid, while the lower ones have been lost. 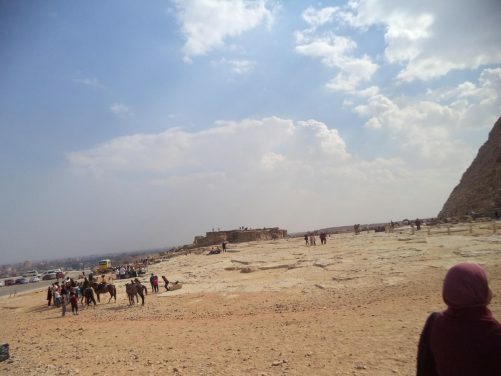 View across part of the Giza pyramid complex site. The site is on a plateau giving a good view over the modern cities of Giza and Cairo. 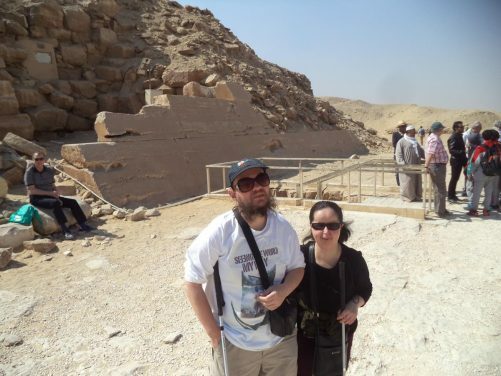 Looking down one side of the Pyramid of Khafre towards the Valley Temple. 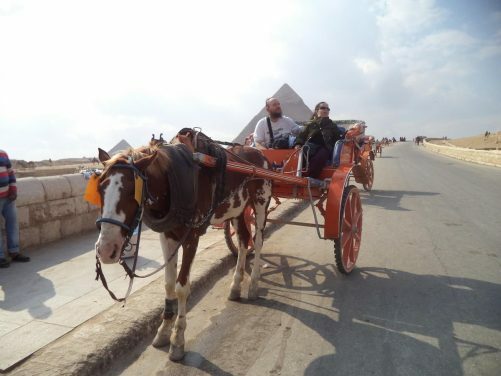 Tatiana and Tony in the horse-drawn carriage in front of the Great Pyramid of Giza. View down the east side of the Great Pyramid of Giza. The entrance to the Mortuary Temple of Khufu can be seen and beyond one in a row of three smaller subsidiary pyramids, popularly known as the Queens’ Pyramids. These smaller pyramids are all of similar design and originally stood at around 30 metres in height. The horse-drawn carriage heading down a road approaching the Great Sphinx of Giza. 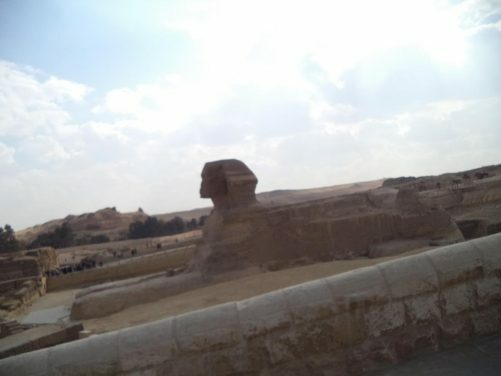 View of the Great Sphinx of Giza, a mythical creature with the body of a lion and the head of a human. 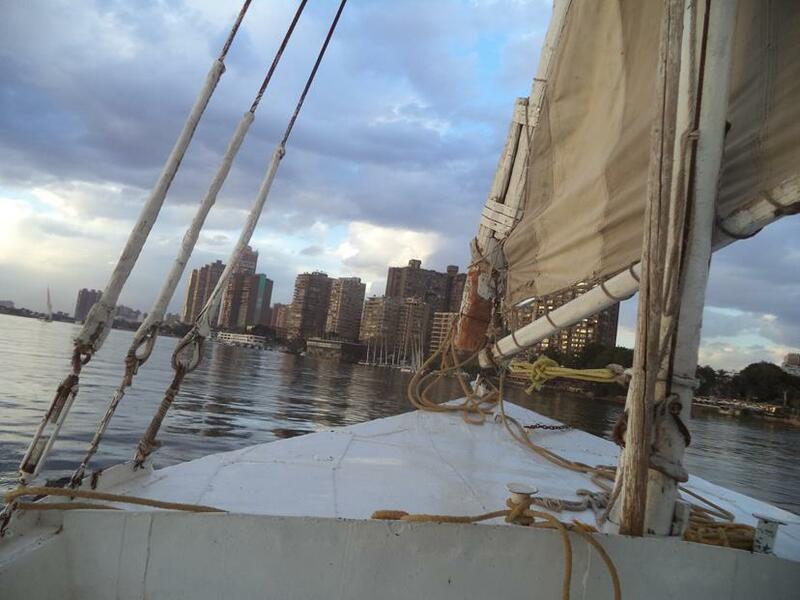 It was built of limestone during the reign of the Pharaoh Khafre (about 2558–2532 BC). Current consensus among many Egyptologists is that the head of the Sphinx is that of Khafre. It measures 73 metres in length from paw to tail and is 20.2 metres in height. 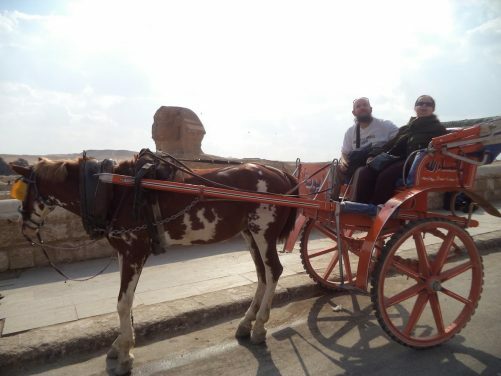 Tony and Tatiana in the horse-drawn carriage with the Great Sphinx alongside. 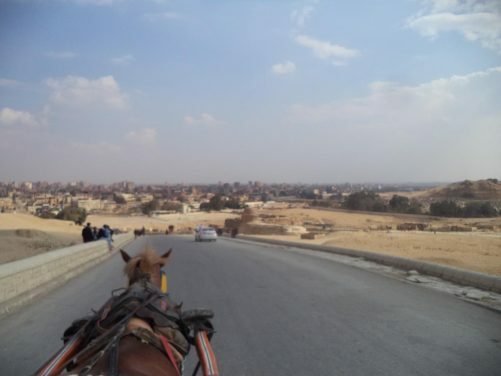 View back along the modern road towards the Pyramid of Khafre. 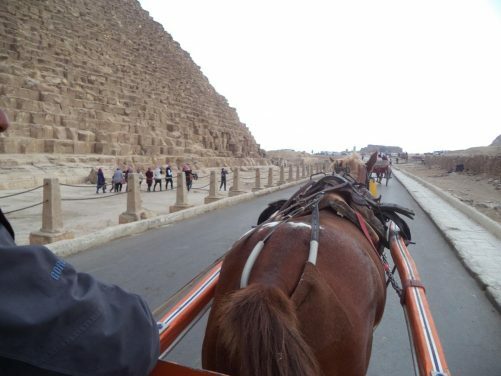 Both the Great Sphinx and Pyramid of Khafre in view with the horse-drawn carriage in the foreground. Tony, Tatiana touching the huge lower stones of the Great Pyramid. Again Tatiana and Tony at the base of the Great Pyramid. 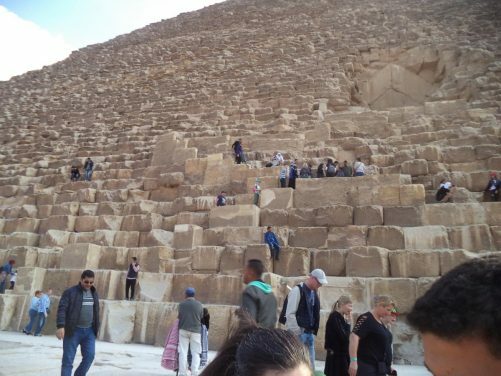 View up one side of the Great Pyramid. People sitting and walking on the lower stones. Tony and Tatiana at the edge of the Giza pyramid complex site with Great Sphinx of Giza and the Pyramid of Khafre behind. 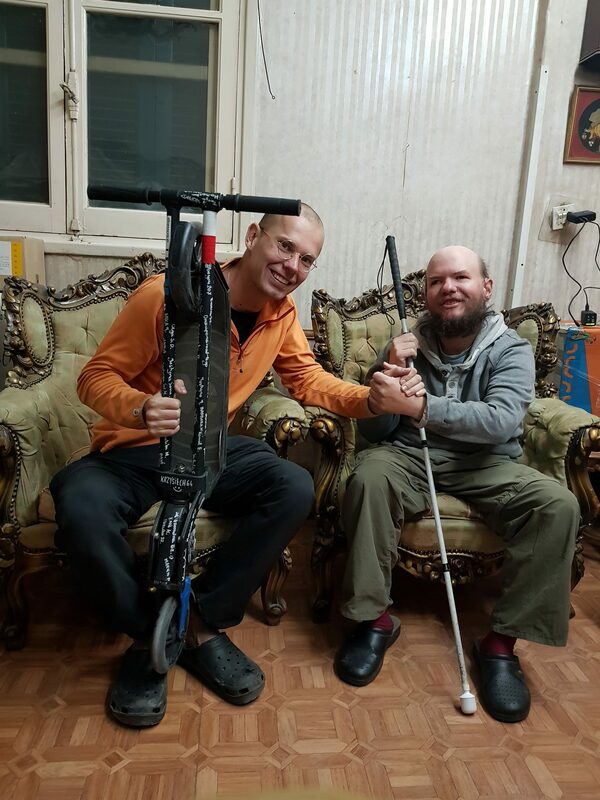 Tony with Tomasz Jakimiuk, a world traveller and blogger/film maker from Poland. 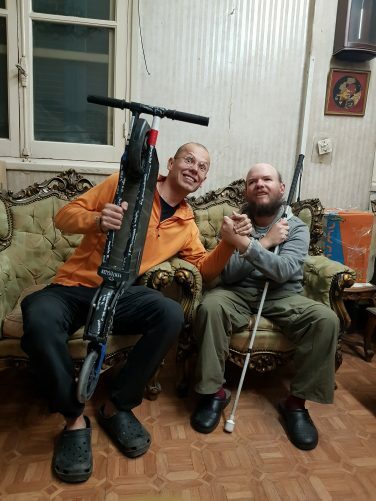 Taken 4th March in the Cairo home of a local Couchsurfer.